Jan 14, 2010 | about NEW products .. 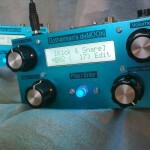 The tiny little four voice polyphonic digital synth called DeMoon by the danish inventor Gotharman is still late with production. We just got the message they wont come for the NAMM to finish up our order, so we will hopefully have stock again soon.